Venerable Master Thich Thanh Tu was born in 1924 in Tra On District, Can Tho province, Southern Vietnam. At the age of twenty-four, he became a novice, learning basic Buddhism under Master Thich Thien Hoa, ordaining in 1953. He completed his advanced studies in 1958. In 1960, he became one of Vietnam’s predominant Dharma teachers, given the post of Director of the Buddhist Educational Department of Southern Vietnamese Sangha. 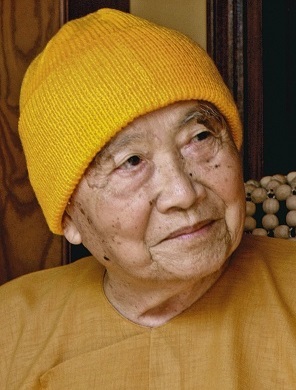 From 1964 to 1967, he was the Manager of Hue Nghiem Buddha Dharma Institute. At this time in Vietnam, most Buddhists were followers of the Pure Land tradition. As his teacher was a master in the Pure Land tradition, Master Thich Thanh Tu learned the Pure Land teachings. He wanted to practise Thien (Zen) but was not able to find a master. In 1968, deciding to practise just Zen meditation, Master Thich Thanh Tu went into retreat on Mount Tao Phung in Vung Tau, vowing to stay until he found the Truth. After a summer retreat, Master Thanh Tu realised the essence of form and emptiness that is beyond duality. The meanings of the Mahayana sutras and the patriarchs’ teachings, which were inaccessible to him before, now became clear. At this time, he decided to revive Vietnamese Thien (Zen) Sect which had disappeared centuries before. Master Thich Thanh Tu built his first Zen monastery in 1970, naming it Chan Khong, meaning True Emptiness. Since then, many people have come to practise with him. Currently, under his guidance, there are nineteen monasteries in Vietnam and sixteen outside Vietnam. His main instructions are: to be fully aware of the false nature of thoughts, and then, to the stay with True Nature which manifest through the six organs. Zen Master Thich Thanh Tu has translated many scholarly texts from the Chinese and has written numerous books of his own. He is a living example for those who aspires the Truth. Master Thanh Tu had travelled to Kampuchea, India, Sri Lanka, Japan, and China. He also had lectured in France, Switzerland, Canada, the United States, Indonesia, and Australia. He currently resides at Truc Lam Zen Monastery in Dalat, Vietnam.